Successfully Added Mini Keyboard - Slim Portable Design to your Shopping Cart. Smallest keyboard on the market today for ultra-portable computing needs. 1/3 the size of a standard QWERTY keyboard, and able to fit in the palm of your hand or in your pocket, it doesn't get more portable than this super slim keyboard. 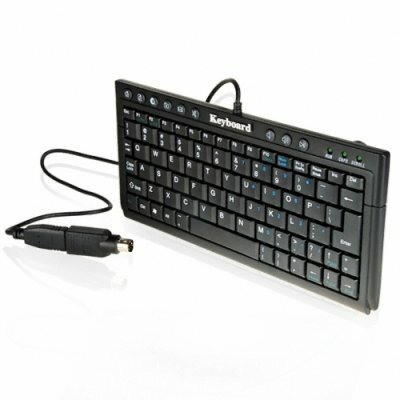 Featuring 75 standard keys in QWERTY layout as well as 9 computer and media shortcut keys, plug and play compatibility with Windows XP and Vista, the ability to run through a USB or PS/2 port, and powered directly from the computer, this is a keyboard that can go almost anywhere you go and do everything its larger standard keyboard cousins can do. Source this wholesale keyboard for your own online store for a highly profitable item that is sure to attract more visitors to your page, and don't forget to mention that it comes with a one year warranty!